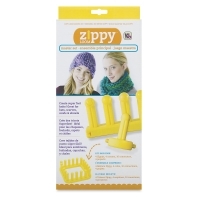 Anyone can knit with the KB Zippy Loom. Even beginners can knit a chunky scarf or hat in as little as 20 minutes. The large pegs produce very quick projects using a simple wrap and hook process. Super bulky yarns, ruffle yarns, and boucle yarns work best. Or you can use double strands. Make your own stylish hats, scarves, blankets, and more. 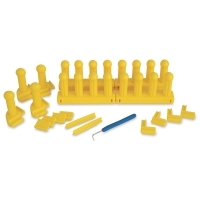 The Zippy Loom Master Set includes everything you need for four unique configurations. It comes with four Zippy Loom sections, four corners, 10 connectors, a loom hook tool, detailed step-by-step instructions, and four project patterns. 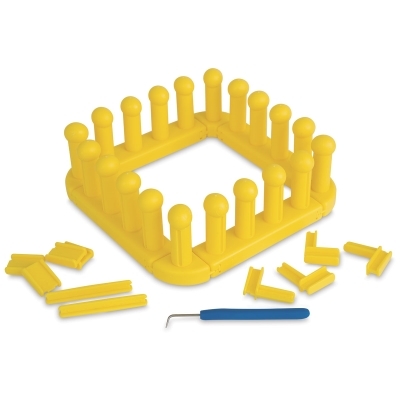 Expand your loom size by adding more pieces. Knitting with one Zippy section produces a 3" to 4" width. Knitting with two connected Zippys produces a 6" to 8" width. Connect as many Zippys as you want! 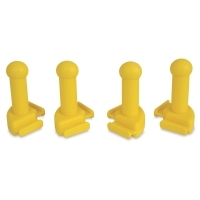 The modular parts are made of extremely sturdy high-grade plastic. 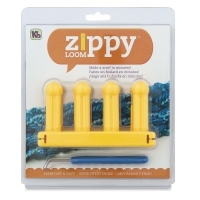 Zippy Loom — Build a longer Zippy to create wider items like blankets, shawls, and wide scarves. 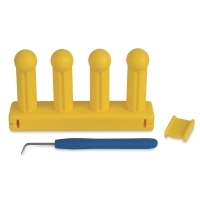 Package includes a four-peg Zippy, a connector, a loom hook tool, and detailed instructions. 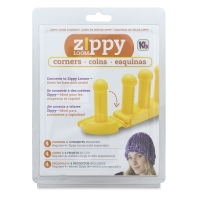 Zippy Loom Corners — Great for making hats and cowls, Zippy Corners connect to Zippy Loom sections to create a round loom. The pieces easily snap together. Package includes four corner pieces and four project patterns. ™ Zippy is a trademark.